gabby sews: Mother's Day Cards - Better Late Than Never! I am so behind on posting my projects!! But...the cards themselves went out on time and that's what counts! Here are some cards I made for some of the mom's in our lives. The owl comes from the Cindy Loo Cricut Cartridge and I cut it out of some Core-dinations card stock. The pattern paper in the background is from my stash and I have no idea where it came from. I printed the sentiment out on my computer using one of the standard fonts that comes with Word. 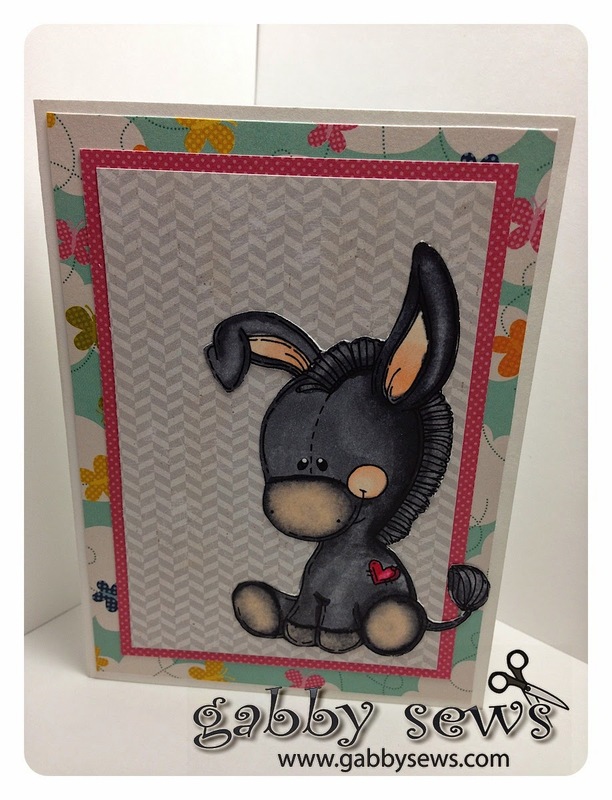 The Donkey is a wonderful digi stamp that was released by Meljen's Designs as a card drive stamp for Michelle Oatman when she needed a pick me up after an accident she had. You've got to check out her blog! It's awesome!! I colored it using my Copics but unfortunately I lost the list of colors that I used. I fussy cut it out and mounted it on some paper in my stash that I think is from American Crafts. I made another really cool card for one of our other moms but I'll be darned if I can find the picture. If I find it, I'll post it later.